Home / Getting Started / What should I call my Help section in my app? What should I call my Help section in my app? 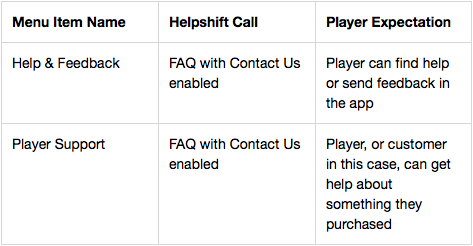 The name of your Help Section (Helpshift FAQs) is just as important as where you place it. You’ll want to make sure that the user’s expectation is met when they click on the link. For example: If you use ‘Help’ for your section, but your user only wants to give you feedback, then they will not know where to submit feedback. That user may not need help with using your app, they may only want to send you feedback. For guidance on where to place your ‘Help’ icon, see Where will the Helpshift option appear in my app? To see what Helpshift looks like from the user perspective, see What does the in-app support experience look like for a user?